Today's job to-do list. It has already grown exponentially longer. The world has begun to slowly rotate again and the seas have calmed since last week’s window-rattling news. The kids have stepped up to check in on their old man; how are you holding up?, what leads do you have?, what are the job prospects locally? As was mentioned a few posts ago, it’s important to me that they be good people. They seem to have paid attention. Today’s letter to Ellen and Reid won’t be posted until next Monday as per the tradition of this blog. The nuts and bolts of what they will read is that it’s all about taking one step at a time and that regardless of what the near or medium range or long term future may hold, this is not the end of our world although it might seem like it. It is a matter of perspective. There is always someone worse off than you are. What they won’t read is a senseless blame game; it’s a little bit me, a little bit others, a little bit economic. The goal is to look forward, not obsess on what already looks smaller in my rear view mirror. Already, well-meaning friends have rushed forward with names and suggestions and leads. 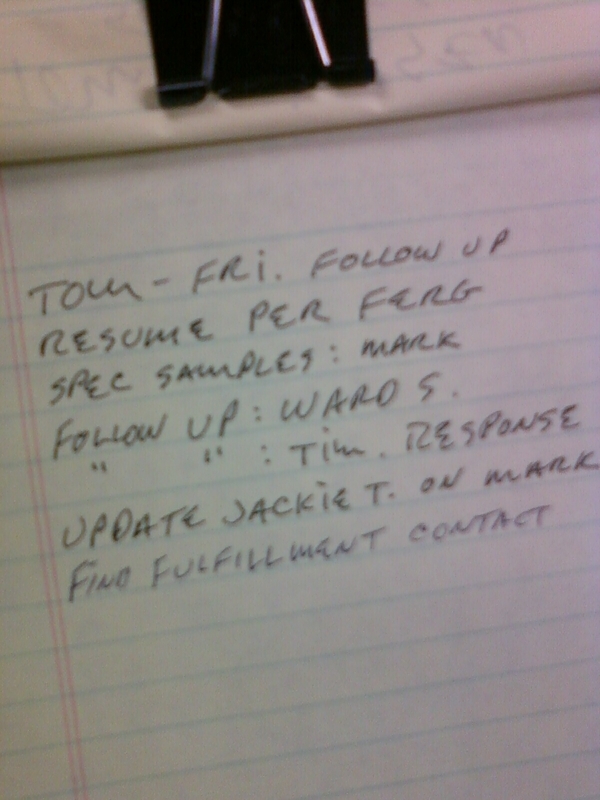 My inkling is the job hunt process is front loaded in just such a way. As I told my two, if nothing pans out soon, if no company hands me the keys to a new cubicle, then the burden shifts to my shoulders in that you can’t go to the well too often to ask people for more help and yet more help. But the big picture I must paint for them is that, like other tough times, this will fade away too. I believe that to be true. My circle of recipients continues to grow wider. Here’s what was mailed to one of my oldest and dearest friends Pete, who, when the hours got progressively dark earlier this month, really came to the fore for no reason. He and I go way back, but his kindness closed that gap of years. Pete: I got up early on Sunday with the intention of heading up to Tryon for a surprise visit but then it dawned on me that I knew neither the name of the camp nor its location. Even my last go-round of there had me ill equipped to re-find it. There weren’t enough bread crumbs on the road to navigate the way. You guys were probably better off without a Harley with loud pipes to max-out the tranquility of a summer camp. That’s not what the parents pay for. Hey, I did want to thank you for everything you’ve done over the past few weeks. You really went above and beyond, especially when you picked me up knowing full well that you’d get little or no sleep before herding your cats toward the airport the next morning. The lift was very much appreciated. It was great to have you at the visitation and the service. That in and of itself was also above and beyond. Things went pretty peacefully for dad. No discernable pain or discomfort. The Hospice folks had a good handle on that although it’s not a job for the timid or faint-hearted. 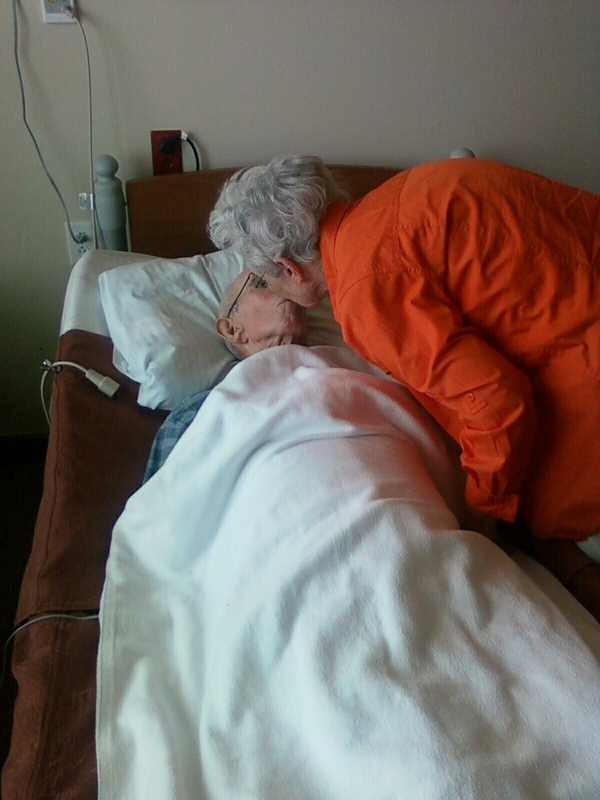 We got into a couple of stories from the Hospice nurses, and man, they really get put through the mill. Dad was on minimal drugs until the very end when the time came for him to ultimately relax and let go. Even though dad appeared asleep for hours and hours, I guess patients can hear and are aware throughout the entire ordeal. I think it’s interesting that they (the nurses) actually encourage the family to talk to – and encourage – patients that’s its fine for them to move on. The thinking is that some folks need to be told that it’s okay to see what is on the other side. We talked to him until the very end. Some of us talked more than others. I don’t think we have anywhere near the same travails that you and Nancy had in terms of ‘stuff.’ Most of it has already been cherry picked but what they did hoard was paper. Stacks and stacks of it; records of bills paid, photos and documents, family histories. Incredible to sort through all of it. But he did a pretty good job of cataloging things but there was a just a hell of a lot of it. Why we needed property tax records from 1963 through 1999 is beyond me, but it is what it is. He saved no trees but then that was before people went green. Do keep me up to speed on your biking travels when you come down toward Greenville. This is pretty much a biker haven down here although you’d have a hard time finding me on two wheels without a motor. To be blunt about it, the drivers down here don’t have a lot of tolerance for cyclists. There are ‘Share the Road’ signs plastered along the roads and streets but I guarantee folks pay them no mind. The locals sure as hell don’t practice sharing in any way, shape or form. That’s especially true when you’re out in the boonies. Yet I’ve thought about getting a bike for leisurely rides around on the green belts and such. You won’t find me tooling around most of the local roadways. Bikers are always getting crunched. Thanks again, Pete, for stepping up. I’ve done a particularly lousy job of staying in touch over the years, and literally have no – zero – relationships with any of our fraternity bros. That’s bothered me, so I appreciate that you’ve rekindled things. Hey, if you and your bride ever need a non-camp base closer to the more civilized parts of North and South Carolina, you know who to call. Things came to pass as we expected at 2:12 p.m. on Monday, June 28. The end was as mercifully pain-free and serene for my father as any of us could have hoped for. As soon as my brother and I gathered ourselves, it was on to the necessary details. As you know better than we, the planning for visitations and a memorial service don’t wait. Perhaps that is for the good. I’ve heard new terminology – ‘pinned’ ears, modeling, etc. – that I don’t need to hear again for a long, long while. It is the language of death. In its own way, it was an interesting element to the process because it put into context what was happening to my father and why. The nurses of Hospice, and the facility where my father (and mother) lived out these last few months, were incredibly professional and caring. I’ve written before that much of this will find its way into the weekly letters. How Ellen and Reid navigate themselves around this sad process while they are here and how they handle the expressions of grief, etc., that will come their way, will be interesting for me as a father to witness. In the coming weeks and months, the three of us will have time to digest everything that has happened and to, hopefully, share our interpretations of it all. I’ve been storing away snippets here and there from this past weekend (indeed, the past few months) and this will no doubt resurface on the pages from a father to his children. This may not be the sort of teaching moment we would like to have but it has come to pass and we will all see what lessons it holds. There’s one equally sad note for me: my father will receive no more letters. Ironically, the final letter to him probably arrived Monday or yesterday. But you can be assured he will live on in paragraphs to others. After this week I thought to ditch the idea of posting the usual archived letter to Ellen and Reid. However, I’ve located one which was an early effort to bring the kids up to speed on the health of their grandparents. Ellen/Reid: The ducks around here never had it so good on a weekend. Steady rain and low temperatures made things just ducky. This is the first weekend in months that I have not played golf at least once, but it was a good weekend to mop floors, stow extra paperwork (of which there was a ton) and just laze around. Did the latter in quantity. Even thought about doing taxes, too. It didn’t stop the birds from chirping up a storm. The trees are almost in full bud, and in a couple of weeks the units behind me will be hidden from view. I was home with a cold Monday, and from my upstairs office (which is now clean) I watched a red shouldered hawk swoop down from his low perch. He stomped on something, and in a flash it was a small snake which, in one deft move, was down the hatch. Never had seen that display before. I fetched my binoculars and watched the hawk once he retreated to the same perch. The identification was made in the green Audubon book. The hawk sat there for 15 minutes then swooped down again on a small bush and made all sorts of a racket before he emerged with some small rodent. Hey, we’ve all gotta eat. I head to Omaha next week for a most unpleasant trip. I’ll be able to see Grandma but am not wholly prepared for it. And the worst part may be forcing grandpa to go around to assisted living centers. Not sure how that will work because he probably won’t want to leave her. He is going against doctor’s orders by taking her home. Neither of them are dealing with reality, and he knows that your uncle and I are not pleased with this. Even before your grandmother’s first stroke, we had nosed around about a new living situation for them. A one floor unit, perhaps aligned to a retirement home. They stew about losing their independence but really, it just means a change of address. I did it. They can, too. It’s not as if either of them would have a monitoring bracelet on their ankles. Their situation reminded me of something this week. Before the storm hit, I was driving home from a meeting several nights ago and the moon was full as it broke through some light clouds. The scene was almost exactly like a painting your great grandmother, Mary Bradley, had painted when she was a young girl shortly after the start of the last century. It was the only thing I wanted when she passed away. Unfortunately, the painting vanished shortly after her death. When the inevitable happens to your grandparents, I’m not sure what their equivalent will be to my grandmother’s painting. I have Mary’s mother’s cast iron skillet (it gets used several times a week) and that’s good enough for me. Thinking about lasik eye surgery. Tired of reading glasses and everything being indistinct. May help my golf game, too, although that is not the reason I’d do it. Just need better eyesight. Have my biker friends Brian and George rolling into town this weekend. Brian has been spending some of the winter in Daytona Beach, and George flies in there later this week. They’ll take their sweet time to come up this way along about Thursday. George will borrow my Harley for some charity ride in these parts, and he may ride it up to Bristol, TN for some NASCAR race up their this weekend. That’s okay with me. This will be the fourth time they have stayed with me, and literally, all I have to do is say “hello” and Brian takes the conversation from there. He has never been at a loss for words. He rivals your uncle in that regard. He can turn emptying the dishwasher into a three part saga. This week in Omaha has been close to an out-of-body experience. Is this really happening? I’m afraid it is. The old boy deserves one more tip of the hat because in his readiness, he has prepared the rest of us. 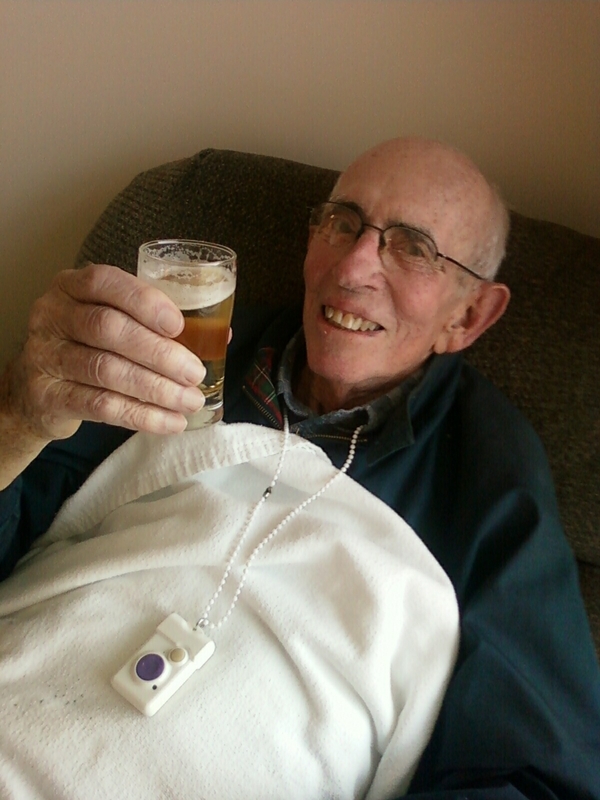 To the degree he can tolerate the discussion – sandwiched around plenty of nap breaks – my dad and I have talked candidly and at length about family, his life-shaping WW II experience as a 20-year-old bombardier, my mother’s health predicament, and, of course, the conclusion to his own health situation. We have mapped out the fine points to his service, he’s chosen pallbearers and opined on key points for his obituary. He gave a gentle nod to a tasteful display of his war photo and a few medals, some of which were discovered buried in a drawer in my mother’s bureau – as we moved her this week to a memory unit. All of this is the stuff of letters. Reid, bless his heart, is particularly taken aback by the goings on. He is near-insistent that what I have gleaned become at some point an official part of the Bradley lore. I aim to do just that. Much of the precious information will be transferred via letters for some time to come. I know of no better way to give the kids an honest representation of their grandfather’s life and times. Some of it is already known to me; yet a new trove of family history – some of it somewhat troubling – has bubbled to the surface. We had some dear, dear relatives travel great distances to pay their respects and much of the bedside talk turned on still more family points worth saving – and sharing. Really, we do it now or it is lost. It won’t be lost if I have anything to say about it. I wrote to my father early this morning, the result of which was mailed to him today at his new address. My hope is he reads it to mom when he visits her in the memory-assistance wing. 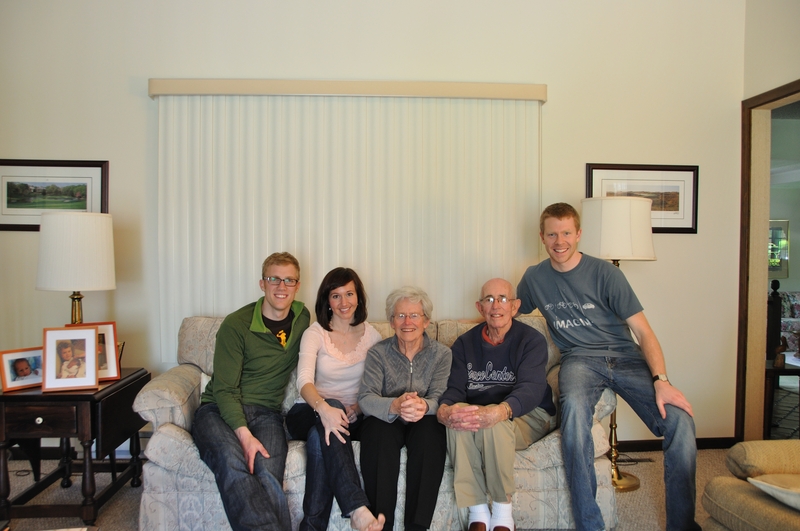 Mom and dad: Of all the ways anyone can spend all their weeks, this week was the way I would spend it. This was everything I’d hope the time with you would be. Short of a different outcome, I would not have changed a thing. It seems to me the one thing that is coming out of all of this is that we are remaining a family to the very end. Reid pointed out to me that lots of families have fractious relationships that, for one reason or another, are beyond repair and that we at least have the good sense to tell each other we love each other – and we can actually mean it. Unbeknownst to either of you, I snuck in a few camera phone shots of you two lovebirds smooching and sent them ASAP to all the grandkids. So in an instant they had the latest and greatest images from L________. Dad, I told Ellen and Reid and Joe of your attitude (and I’ll do the same when I talk to Andy), and it really struck home with those three. They all love both of you dearly. You probably are not aware of this, but as they’ve gotten older, they seem to hold you in that much more esteem. Ellen said that her generation would wear their pain on the sleeve much more than you let on. We were trying to figure out why that was, and the only thing we could attribute it to was you guys simply came from a tough generation that saw a Depression and a Great War. The rest of us are way too soft. If only we could exhibit the strength both of you are showing right now. Dad, you have been the best of dads. Without exaggeration, if your other son and I could be half the man, and father, you turned out to be, well, it would be a pinnacle. That hill is a little steep for us to climb so we’ll each have to get by on a small percentage of the lessons you pass on to us. It bothers me that only now do I think of all those times I didn’t pay attention to what you did and how you did it and why you did it. The same goes for your other son. Why the hell didn’t we have the brains to realize what was there before us in front of our eyes? What goes on from here is anyone’s guess. We’ll leave it in the trusting hands of a higher power. That is pretty comforting to know. We’ve had our share of good times for a long time now, but what went on this week surpasses what has gone on before. It may sound a little odd at this juncture, but in some ways this week was the best of times. Like you said, what else are we going to do about it? You both have paved a road that my brother and I will be only too glad to follow, even if we can’t fill your footprints, if you know what I mean.